Mike Bayne received an MFA from Concordia University and a BAH and BFA from Queen’s University. He has worked with MULHERIN in Toronto and New York since 2004 and has participated in a number of group exhibitions in Los Angeles, Chicago, New York, Vancouver, and Toronto. His work is in the collection of the Art Gallery of Ontario, The Nerman Museum, The Jordan Schnitzer Museum of Art, the Wieland Collection and numerous prestigious private collections around the world. 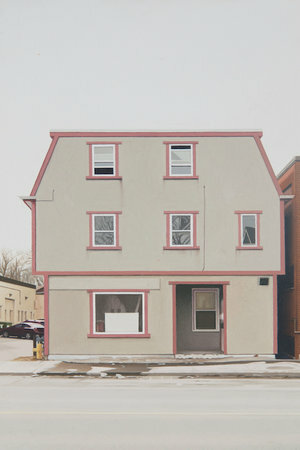 Mike was the recipient of the Kingston Prize for Portraiture in 2011, and had his work in a solo presentation at The Armory Show, 2012 in New York. 2011 Armour, Nicole. Mike Bayne. Square2 Magazine, 2011, Issue 5. 2009 Enright, Robert. Detailesque. Border Crossings Magazine, Issue 110. June 2009. 2009 Balzer, David. Eye Weekly. April 1, 2009. 2006 Rogerson, Stephanie. Painting Mimico. Now Magazine, October 19-26, 2006. 2005 Dault, Gary Michael. Finding the Brushstrokes?. Gallery Going. Globe and Mail.